Well, I just don’t know…. ……if the Bible says that. In this age of information technology why is there still so much uncertainty? When I first got saved I went to buy a Bible and the gentleman behind the counter suggested a Thompson Chain Reference Bible. It was a King James Version of course but what got my attention was how you could look up a topic – like marriage and see every instance where “marriage” was mentioned from Gen to Rev. No commentary or discussion or opinion just every single scripture related to that topic. Wow! What I also realized as I looked threw the topics was that God has an answer to every question or topic imaginable. Anything you could think of related to the Word of God and how it can apply to you is easy to find. There doesn’t have to be any ambiguity or confusion if you are a believer. Just look into God’s Word and you’ll find the answer. ….because the Bible is so confusing! …..which Bible version is trustworthy? …..if the Bible is relevant for today. …..because you can make the Bible say what you want. I have heard people say that the Bible is confusing because of its old world language. Today we have so many translations that speak in plain, easy to understand language. I like the King James Version, also called The Authoritative Version, but really it is a translation also. Yes! That’s true. The Bible in any English version is a translation. Jesus spoke Hebrew, Greek and Aramaic – not English. Having said that you might wonder how we can know that our English Bible is correct? The answer is a Concordance. A concordance takes every word in the Bible and shows us what the Greek (for the New Testament) and Hebrew (for the Old Testament) words were and what they mean so we can see how it was translated and learn. Granted, some translation can be more elaborate than others but I believe in God and His power to protect His Word. After all the Word was withheld from the common man for centuries but God’s spirit prevailed. Regarding the ability to manipulate the Word of God. This can be done if you take scripture out of context and pick and choose what you want to site. But in context and supported by other scripture on the same topic the Word of God is true. God’s Word is not full of contradictions if you take the time to study it. But so many people want to be fed tiny Sunday bites of the Word of God rather than feast on it by personal study time. Lastly, if Jesus is the same yesterday today and tomorrow why isn’t His Word relevant for us today? Did God not know that we would be here in 2017? Are the circumstance’s and challenges we face a surprise to Him? Are things today really that different then 2000 years ago? I don’t think so. Sin is sin regardless of the civilization, technology or calendar. Thankfully God is still on His throne and we can know the truth and it is that truth that will make us free. This entry was posted in Inspirational and tagged Bible relivance, Biblegateway.com, Christianity, Faith, Family, Goggle, Holmans Study Bible, Information Technology, IT, King James Version, Life, Manipulation of God's Word, Religion, Strongs Exhaustive Concordance, Thompson Chain Reference Bible, What to do? on January 27, 2017 by tknot57. Does your shopping list include bread, milk, cold cuts, lotto tickets and scratch offs? Many people do. Many Christians do too. After all as a Christian we could do so much good with alllllllll that money. Right? Where’s the harm in that? From cover to cover The Word of God tells us how much God loves us. In the Old Testament we learn the Names of God as He revealed Himself to the children of Israel. He is the God our Provider, The God our Healer, He is God Almighty, The God Who goes before us and so on. In the New Testament we see God incarnate – God with us. The Creator of the universe left heaven to walk amongst us and even suffer unbearable things and die for us. We need to grasp just how much we are loved and be humbled at the thought of it. But don’t forget to check your numbers! You gotta be in it to win! Today might be your lucky day! Someday my ship will come in! But seriously brothers and sisters look at what the Word says about God’s provisions for your life and the trap of riches. God has no problem with wealth. Look at Solomon – the richest man ever – past, present and future. That’s just one example of people God has blessed with great wealth because He wants to bless us. God promises to open up the windows of heaven and pour out a blessing on us that we can not contain – if we are good stewards of what He has already given us. If we fall into the trap of thinking that we don’t have enough or that we would be better off winning the sweepstakes what we are doing is telling God He is not enough or worse – He lied! Thou shall not covet! It’s one of the Big Ten! Covet. Such an Old Testament word. Covet – to desire, be envious of, want or lust for. Now I know that none of us do that but there’s plenty of opportunity to if you did. The TV, Magazines, Billboards, Social Media all flash images of things we don’t have, or newer, bigger, nicer, better versions of what we do have, in our face. So naturally we want the newest, bigger, best, whatever. After all look at what we do have! ugh! It’s old, it’s dull, boring, outdated. It’s a trap. A trap to get you to devalue the blessings that God has given you – spouse, job, money, home, stuff, etc., and lust after something you don’t have and can’t afford to have. But, if I could just win the Lotto my problems would be solved. No they wouldn’t! Goggle lotto winners and you’ll find many have lost it all. Spent it, gave some away, got robbed, whatever that case. The sweepstakes did not solve their problems. Only God can do that. He may be doing that already and you just don’t see it. If you are working – you’re blessed! Many people aren’t. If you’re working but unable to make ends meet. Look at what you spend your money (God’s Blessing) on. If you are not working ask yourself why. If you’re health prevents you from working – Pray for strength or assistance. If you are healthy enough to work but aren’t ask yourself why. Pride is a big hindrance to getting a job. “I’m a college educated ________ and I’m not going to work for anything less than $_____ an hour/day/week. Get a job. Any job and pray that God blesses your humility. I have countless stories of people I know who are in great positions but started at the bottom. Instead of wishing you could win the jackpot and get all those new, bigger, brighter, better things, thank God for what you have right now. Because either God loves you and has provided for you and will continue to provide for you. Or He is a LIAR! God is NOT a Liar. But He told us about one and we should be careful not to fall into the traps set by that liar. He (the devil) comes to kill, steal and destroy. This entry was posted in Inspirational and tagged Christianity, covet, Get a JOB!, God our healer, God our provider, gratitude, jackpot, Life, lottery, lotto, Lust, magamillions, Phillipians 4:19, powerball, prayer, Truth, winners on January 24, 2017 by tknot57. As I sit watching the inauguration of the 45th President of the United Sates with it’s procession of dignitaries, past Presidents, and all it’s pomp and circumstance with one thought in mind. Is Donald J. Trump God’s man for the job? Is he? Does God even concern Himself with who sits in the Oval Office? The Word of God would lead us to believe that God isn’t a nationalist. He is not a respecter of persons and wishes that all men (and women) come to the saving knowledge of the Lord Jesus. We know that He loves the children of Israel. The people, not the nation. The Word of God tells us that we are not of this world. We are, in fact, strangers in a strange land. This is not our home. At the same time we are instructed to pray for those in leadership positions over us. Pray for the Peace of Israel. To follow after peace and treat each other as we would want to be treated. But all this doesn’t answer the question – Is our 45th President ordained by God? In my humble opinion – Yes! God ordained Donald Trump to be President at such a time as this. Not, because he will be the savior of the USA or the hero of our nation. Not because he is a deeply religious man. Not because he is an accomplished statesman. No. The now, President Donald J. Trump, is ordained by God to lead our nation because God is in control. From His Throne on High, God orchestrates the course of history to accomplish His goals. He allows nations to rise and fall, leaders to come and go, in order to fulfill is mandate – save souls! God desires that no man perish! He know the number of the hairs on our head, He collects our tears in a bottle, He loves us with an everlasting love and sent His own Son to die for our sins. It is this Father God in Heaven Who loves us enough to care about who is our leader. Weather that leader is great or small. Fallible or infamous. Religious or secular. No matter if you love our new President or hate him if you call Jesus Lord and God your Father you must pray for him and trust that God is in control. Presidents will come and go but Jesus is the same yesterday, today and tomorrow! May God Bless President Donald J Trump and May God Bless America! This entry was posted in Inspirational and tagged 1 Timothy 2:1-5 NKJV, 45th President of US, Christianity, Divine Intervention, Donald Trump, Faith, Franklin Graham, God Bless America, God's Love for us, Life, Mr. President, Oval Office, POTUS, Presidents, Religion, Unity on January 20, 2017 by tknot57. Sticks and stones will break my bones but names will never hurt me! Truth be told, they did hurt. Even more than the cuts, bruises or broken bones that may have been caused by sticks and stones. That’s because words, and name-calling, have power. Maybe even more then we can know. Yes. Words really do have that much of an effect, both on us and those whom we speak to. What would you give in order to have someone speak positively to you? How much would it mean to you to have your father speak to you about your future? Two brothers were born into a family. The firstborn son was in line to inherit from the father. The second son wanted his brothers inheritance. Desperately! So much so that he tried to take advantage of his older brother in a moment of weakness and trade him for it. The older brother half-heartedly agreed to the trade not thinking anything of it. Still not sure that he obtained the inheritance, the younger son impersonated the older brother and stood before his near blind and dying father to get the coveted gift. He did indeed receive the fortune. Which the Lord has blessed. And let your mother’s sons bow down to you. Yup! That’s it! The coveted inheritance that Jacob tried to steal from his brother and deceived his own father, Isaac, for was a blessing – words. Words spoken over him by the man in authority over him that he allowed into his heart. Words that sealed his future and set the course of his destiny. If only we were not so advanced a civilization and would remember these lessons from the Old Testament. The lesson that a father or a mother or a teacher or any authority figure, real or perceived, can speak into the heart of a child and shape their future. Like it or not. Believe it or not. Words are that powerful. that if you confess with your mouth the Lord Jesus and believe in your heart that God has raised Him from the dead, you will be saved. For with the heart one believes unto righteousness, and with the mouth confession is made unto salvation. What does that mean? It means that your words affect your life. Whatever you have, or don’t have in your life today is a result of yesterday’s speech. How can our speech have such a significant impact on the reality of our circumstance? Because it’s a reflection of ourselves brought about by our own creative ability working in conjunction with one of the forces around us. God or evil. Isaac blessed Jacob and Jacob believed in his heart that those things would come true. I’m sure he even told people that they would come true. God told Abraham that he would be the father of many nations in spite of his old age. God even changed his name from Abram to Abraham which means “father of many” so when ever he told someone his name he was saying “Hi, I’m a father of many!” Imagine that! It is recorded that “Abraham believed God and it was accounted to him for righteousness.” He was “in-right-standing” with God because he believed what God said to him about being the Father of many nations. He believed it and spoke it and it came to pass. He co-operated with God in the creative process and it came to pass. There’s examples of how unbelief and doubt stopped or could have stopped the hand of God. Yes, it’s true – when the angel came to Zacharias to tell him that he would have a son in spite of his obvious age he doubted and questioned it’s possibility. Shutting Zacharias up did not change his heart but it stopped him from speaking against the plan of God. Once the child was born his mouth was opened and his heart was changed. God’s will was done. Likewise, even Jesus was unable to perform many miracles in His hometown because they did not believe He could. He went to His hometown and began to teach them in their synagogue, so that they were astonished and said, “How did this wisdom and these miracles come to Him? Isn’t this the carpenter’s son? Isn’t His mother called Mary, and His brothers James, Joseph, Simon, and Judas? And His sisters, aren’t they all with us? So where does He get all these things?” And they were offended by Him. Imagine that! And He did not do many miracles there because of their unbelief!! They tied the hands of God! If only God would shut our mouths sometimes so that we do not tie His hands with our doubt filled words and unbelief. What do you believe about yourself? Your life? Your God? Your Savior? Search your heart or better yet, look around you? Do you have a medicine cabinet full of drugs? Do you stress out over your checkbook balance? Do you shake your head at the promises of God found in His Word because you don’t think they apply to you? Just how far does your faith in Jesus go? How much do you believe? Does your words agree with His? He loves you and died for you and has a future and a hope for you not just to live this life but to have it more abundantly. But you have to believe. The Word of God tells us that God Himself asks us to remind Him of His promises! Brother James Orr understood the power of the tongue and I will always remember that lesson he taught me. This entry was posted in Inspirational and tagged "How am I? ", A child of the Most High God, Beliefs, Beloved Brother James Orr, Blessed and Highly Favored, Bullying, children, Christianity, Faith, Family, In Memorium, Life, Life and Death, power of words, reality, Religion, speech, stress, stresses of life, thoughts, Trust in the Lord, Truth, Word of Life Ministries Freeport NY, Words on January 17, 2017 by tknot57. Spring. Warmer longer nicer days. March Madness in affect and pitchers and catchers reporting for training in warmer southern states. Children’s thoughts turn to recesses and proms and the soon end of school days. It’s time for Spring cleaning, Spring plantings, Spring flowers and even the putting away of the Winter clothes. We come out of whatever type of Winter we may have had and look out onto the hopeful horizon of Summer threw the eyes of Spring. We are happy that it’s here and walk with a spring in our step (forgive the pun) and a song in our heart. As we should. This world is not our home and when we die it will not be over. When we die “it” will have only just begun. “It” is Eternity and this life, however long, will be a millisecond compared with the eternity that awaits us all. Where we spend that eternity and what we are resurrected into (life or damnation) is entirely up to us. Jesus came from Heaven and walked this earth to teach us the truth about life and to save us from our sins. Trusting in Him and His sacrificial death on the cross means that when this body dies we will still live. We will live on instantly after death with Him in heaven in our spirit form and we will live in our resurrected bodies when the Lord raises us up. Unfortunately, this will not be the fate for all of humanity. While the invitation may be open to all, not everyone will RSVP. Your invitation has been sent. It has your name written in gold leaf lettering. It has a raised official stamp next to the hosts’ signature at the bottom so accept no imitations. It has no expiration and is non-transferable but you should reply quickly. This invitation is for the feast of the centuries. It’s taken thousands of years to plan. The costs are covered by your host who paid for it all with his blood, sweat and tears – gladly! Most importantly – He did it for YOU! He waits for your reply. Won’t you accept His invitation to be brought up out of the cold hard ground we call this earthly life and stand tall in the warm light of the Son for all eternity. 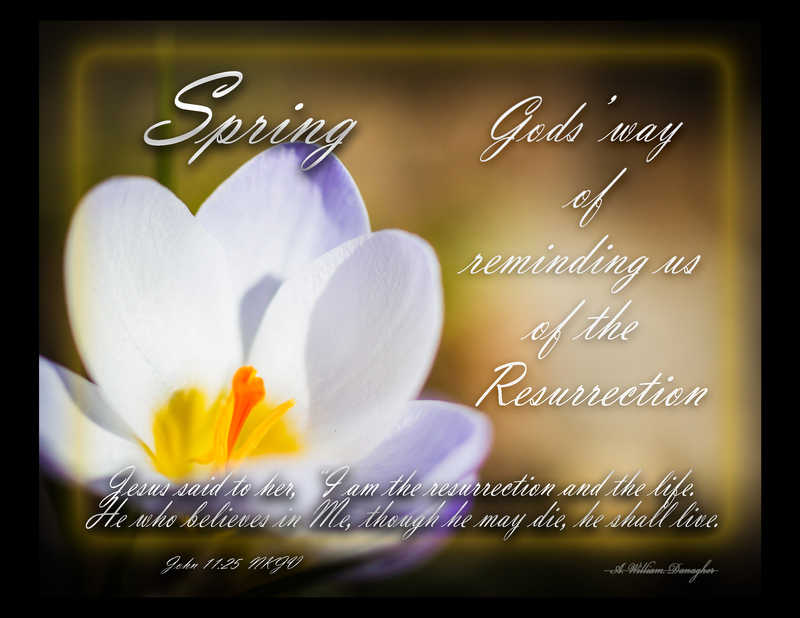 This entry was posted in Inspirational and tagged Christianity, Encourgement., Faith, Gods Love, Invitation, Jesus, Jesus Christ, John 11:25, Life, Ressurection, Scripture verses, Spring, The Cross, Tulips on March 22, 2014 by tknot57.